Coptic Cairo is an area where on a small piece of land we find a huge concentration of christian monuments, including Jewish Synagogue of Ben Ezra, remains of the ancient fort known as Babylon, famous Hanging church and a unique Coptic Museum dedicated to this almost vanished culture. Fort Babylon in the Old Cairo quarter. Promenade along Old Cairo quarters. Facade of the Coptic Museum. The word "Copt “or more accurately, "Gibt", once sometimes written "Gopt" or "Kopto". This was the name given, after the Arab conquest, to the Christian inhabitants of the Nile Valley. 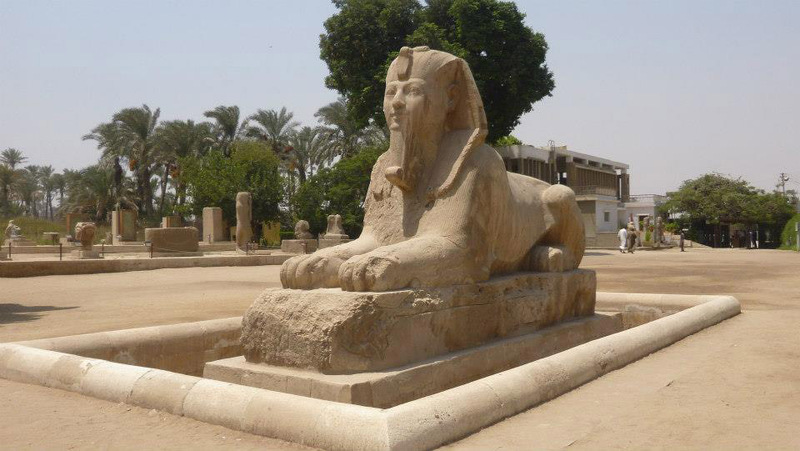 The name is derived from the Greek word for "Egypt". Most probably the Greek word is itself a derivative of the hieroglyphic expression Hu-ka-Ptah, which means "The temple of ptah's soui", one of the names given to Memphis, the Ancient capital of Egypt at the time of the Pharaohs. The Coptic language , moreover, is the same as the ancient Egyptian but in the late form spoken by the inhabitants of Egypt throughout the first centuries of the Christian era. Once a sizable Christian settlement that had no fewer than 42 churches in the area of about 60 acres, it is now confined to a much smaller area and lies within the old Roman Fortress known as Babylon. It contains some dozen churches and monasteries as well as The Coptic Museum . Babylon was the name given to the area, according to the writer Diodorus Siculus, by prisoners of war from Babylonia in Pharaonic times. The constructions were fortified by the Persians, and it was in Roman times that the great bastions and heavy fortifications were built. The Roman emperor Trojan, who garrisoned a Roman legion there, built the fort in AD 100. The original fort was quadrilateral and enclosed an area about 200 meters wide and 400 meters long. The walls of the fort were 11 meters high and almost 3 meters thick. The walls of Babylon were virtually intact at the end of the 19th century, but only parts remain today. Within the walls of the old Roman fortress of Babylon we find the oldest Coptic churches: Abu Serga – St. Sergius, El-Muallaka – Hunging church, Sitt Barbara – St. Barbara, El-Adra – Church of the Virgin also known as Kasriyat er-Rihan and Mari Girgis – St. George. Usually old Coptic churches do not front on to the street and cannot be distinguished from the neighboring houses. The entrances have been walled up at some time in the past as a protection from attack, and they are entered by a small side door. The crypt where the Holy Family hid lies to the left of the sanctuary. The original cave, situated beneath the center of the choir, was later built into a three-aisled chapel with an altar in the wall in the form of a tomb-recess. One of the oldest churches in Cairo is Abu Sergius. It marks one of the traditional halting places of the Holy Family in Egypt. The church is dedicated to two Roman officers Sergius & Bacchus, martyred in the reign of Maximian in Syria. The earliest part of the building dated to the 5th century and was constructed over the cave where, according to tradition, the Holy family hid during their flight into Egypt. This church was burned down and rebuilt in the 8th century, and then again partially restored under the Fatimids. It has basilican style plan with 3 aisles of 27 m long, 17 m wide and 15 m high. The church is entered by a small side door. Despite the reconstructions, the church of St. Sergius is still regarded as a model of the earliest churches in which Copts worshipped. The Church of St. Barbara is one of the largest & finest in Egypt. It is dedicated to a young woman of Nicodemia in Asia Minor who was killed by her father when she tried to convert him to Christianity. Originally the church was dedicated to Saint Cyrus & Saint John and may date as early as the 4th century. Once the church was rebuilt by a wealthy scribe in 684, destroyed by the great fire of Fustat in 750 and subsequently restored in the 11th century. Later, when the relics of St. Barbara were transported there, a new sanctuary was added to house them. The main part of the church is dedicated to St. Barbara. The shrine, dedicated to 2 martyrs, where their relics are kept, form the extension to the left of the sanctuary. Located in a heavily populated area, the Hanging Church was suffering from environmental hazards including air pollution, a high subsoil water level, a high rate of humidity, and leakage of water from the outdated and a decayed 100-year-old sewage system. Other damage included decorations of the church’s wooden ceiling being stained with smoke and the impact of the 1992 earthquake, which resulted in cracks in the church’s walls and foundations. Now, after 16 years of restoration it is finally open to public. The Hanging Church – one of the oldest in Egypt - is the first church to be built in Egypt in Basilican style. It was built on top of a Babylonian fortress and became the seat of the Bishop of Babylon in the 7th century. The church is also known as “Hanging” or “Suspended” as it rests on 2 south-western bastions of the old fortress of Babylon. The baptistery of the church is constructed above one of the bastions, and its eastern and western extremities rest on the two south-western bastions. Thus the nave of the church extends over the rampart that led into the ancient fortress. Important religious ceremonies were held there and in the 7th century it became the first seat of the Coptic Orthodox Pope of Alexandria in Cairo. It was also a court for breakers of church rituals and laws. Once destroyed in the 9th century it was restored in the 11th and made the seat of the Coptic Patriarchate. Al Moallaka church has undergone periodic renovation from medieval right through to modern times. Consequently, some of the reused wood and stone-work dates to an earlier period than the structure in which they are housed. The main part of the church has a wide central nave and narrow side aisles, separated by 8 columns on each side. The vaulted timber roof has been restored. The columns have Cornithian capitals and are, with one exception in black basalt, of white marble. The inlaid woodwork of the church is among the finest to be found. Cedarwood and ivory were used for the sanctuary screen; the latter is carved into segments of exquisite design and set in the woodwork to form the Coptic cross. A small church dedicated to Takia Hamanout, an Ethiopian girl, leads off from the main church to the right, near the altar. The screen that separates it from the main church is regarded as one of the finest examples of Coptic woodwork of the 19th century. Two wall-paintings in the chapel of the much venerated Ethiopian saint are badly faded. One shows the 24 elders of the apocalypse with halos above their heads standing in a row, and the other is of the Virgin & Child. Mari Girgis or St.George is a Greek Orthodox church. The church is approached by a flight of stairs that lead to a spacious compound that includes the monastery and the main church. A view of the ram-parts of the old Roman Fortress can be seen to the left and right of the ascending stairway. The church which is large and elegant is actually constructed on top of the northern wall. 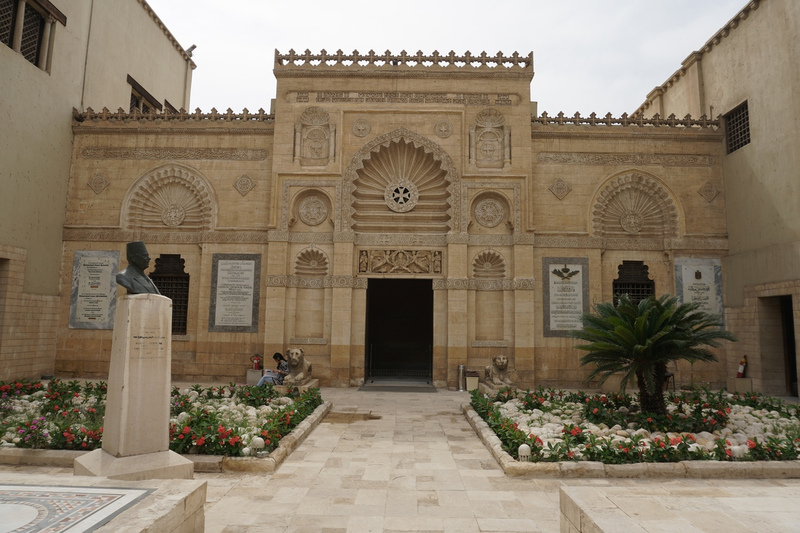 The Synagogue of Ben Ezra is the oldest surviving synagogue in Egypt, the Jewish community in Old Cairo believe that the synagogue has been in existence since the time of Moses. Most of ancient books confirm that this is the place of the ancient synagogue of Ben Ezra which was transferred into a Christian church in the 5th century, remained such until the 9th century when the Jewish community recovered it back by paying 20 000 dinar as the Copts’ debts for the place rent. However, most of decorative works date back to 12th century. To the rear of the synagogue, an important discovery was made in 1896 in a secret room on the upper floor. During clearance of accumulated rubbish, rare original manuscripts were found that date to the Middle ages. Known as the Geniza Documents, the unique discovery includes marriage contracts, trading activities, even outstanding bills, and relates to all aspects of Jewish life in Old Cairo at that time. Also the Old Testament written by the hand of scribe Ezra and dated back to the 1st century BC was found in the synagogue (now in Cambridge university). It is regarded as one of the most remarkable literary discoveries in modern times. The synagogue is surrounded by many Coptic churches and cemeteries, the area occupies around 3500 meters and the building itself consists of 2 floors: the lower for men and upper for women and is 269 meter with 8,5 meters high. From the southern side of the synagogue we find water well called Mikfa used for washing. The main entrance to the building is located in the west-southern side. Inside the synagogue on the upper floor we find 12 marble columns with different kinds of capitals carrying the ceiling and the same on the lower floor but the columns here are made of cement. Two rows of columns on the lower floor divide the hall in to 3 parts. At the northern and southern sides we can see 3 niches used as a library for the books. In the middle of the hall there is a marble stage beside its sides we find parts of marble with inscriptions mentioning Moses who prayed for the God to save Israel. The upper floor of the synagogue is for women, it is reachable by a flight of wooden stairs outside the building. The stairs surround the building from all sides except the eastern one. At the end of this upper floor a closed from all sides room was found, the room managed to open from above and there the Ginza was found.